Every nation has symbols that help build identity. Our emblems make us different from other peoples and inform our character. Our nation chose its own badges; they are essential elements in our heritage and universal symbols of the Basque people. The elements Basque identity is usually associated with are the ikurriña or Basque flag, the Tree of Gernika, the lauburu or Basque cross, the eguzkilore or Basque sunflower, the argizaiola (fire of the dead) and the makila or Basque walking stick. Read more about them, their origins and meanings, here. Created in 1894, the Basque flag or ikurriña (ikur = sign; egiña = made) was meant to be the symbol of the Historical Territory of Bizkaia. However, in a little over 30 years, it came to stand for the Basque Country as a whole. In 1979 it was recognised as the official flag of the Autonomous Community of the Basque Country, which comprises the Historical Territories of Araba, Bizkaia and Gipuzkoa. Today, it is an institutional symbol of the Basque Country. 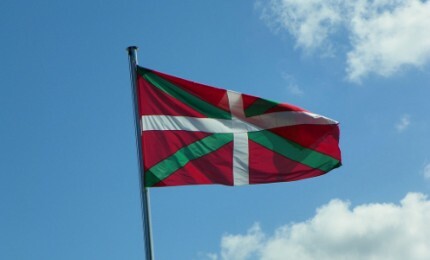 It is made of a red ground that stood for the coat of arms of Bizkaia (by extension, the Basque Country); a green saltire that stands for humbleness, suffering and hope (and, on a different level, the Tree of Gernika); and, over them, a white cross, representing the ethical values of the Basque people (and the foundations of Basque law). The background in red also evokes the battle in the valley of Padura, where the Basque people fought the soldiers from the kingdom of León. With the blood they shed, the stones turned red, and the place came to be known as Arrigorriaga, a toponym that means ‘red rock’. The Tree of Gernika stands for the traditional liberties of the Historical Territory of Bizkaia – and of the Basque people at large. It is an oak tree in front of the Assembly House in Gernika. The tree we can actually see today is a descendant of the ‘father tree’, which used to stand there when the old charters or statutes, known in Spanish as ‘fueros’ where abrogated and the gentry of Bizkaia swore to protect the territorial liberties. General Assemblies began to be held by the tree. Today, the Tree of Gernika continues to play a major role in the political life of the Basque people, for it is the place where the Lehendakari (President of the Basque Government) and the General Governor of the Historical Territory of Bizkaia, among other important authorities, take office. The Basque cross or lauburu (lau = four; buru = head) is a very old mythological symbol that represents the sun. A moving star in the form of a curvilinear helix, it is quite common in European mythology, being mostly associated with Celtic traditions. Since the sun drives the dark (and evil with it) away, the lauburu is a good omen. This is why many Basque houses and caseríos (traditional country dwellings) bear it over their front doors, carved in stone. It is also used as a motif to decorate doors, wardrobes, boxes, tombstones and jewellery. The eguzkilore (eguzki = sun; lore = flower) is a powerful symbol in Basque mythology. It represents the dried flower of wild cacti. In the past, it was believed to scare away evil spirits and other dangers. It can still be seen on door lintels and chimneys, or as a decorative element in jewellery. A traditional contraption from the sixteenth and seventeenth centuries, the argizaiola (argizari = candle; ohol = slate) is a wooden board with a very thin candle wrapped around. The board carries the holy fire of the home. In religious ceremonies, it burnt in memory of the departed. The makila is a traditional walking stick originally used as a weapon for self-defence and for hunting. With time, it became a tool as well, especially among shepherds, helping them in their errands in the mountains and being a measuring instrument. Now it carries symbolic value when it is used in games, songs and rituals. It is associated with power and respect. Lehendakaris, town mayors and other Basque leaders carry a makila as a sign of their authority. Those presented with a makila are paid public tribute through it.